In the post dated 23-12-2007 a free response question on inductance was discussed. You can access that question along with other questions related to inductance by clicking on the label ‘inductance’ below this post. 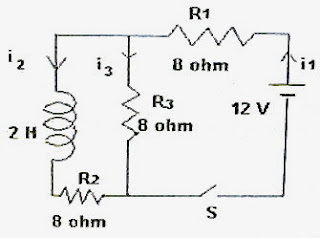 The circuit pertaining to the question referred to above is shown in the figure. (1) In the circuit shown, the battery and the inductor have negligible resistance. The currents through R1, R2 and R3 are i1, i2 and i3 respectively when the switch S is kept closed. The switch S is closed at time t = 0. (a) Calculate the potential difference across the 8 Ω resistor R2 immediately after closing the switch S.
(b) If the inductance is replaced by an uncharged 10 μF capacitor what will be the potential difference across the 8 Ω resistor R2 immediately after closing the switch S? Justify your answer. (c) After reaching steady state, in case (b) what will be the potential difference across the resistor R2? Justify your answer. (d) If a 16 Ω resistor is used instead of the capacitor mentioned in (b), calculate the current through R2 immediately after closing the switch S.
(e) Show the nature of variation of the potential difference across R2 with time t in cases (b) and (d). (2) In the above circuit, suppose the switch S was closed for sufficiently long time so that steady state was reached. In this steady state the switch S is opened at time t = 0. (b) Calculate the potential difference across resistance R2 immediately after opening the switch S.
(c) Calculate the total amount of heat generated in resistance R2 after switch S is opened. (d) Calculate the power dissipated in resistance R2 in the steady state, before opening the switch S.
Try to answer the above two questions which carry 15 points each. You can take about 15 minutes for answering each question. I’ll be back shortly with model answers for your benefit.